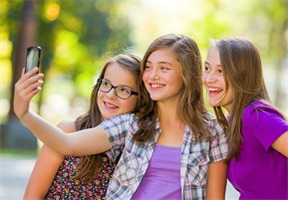 Candice Odgers, a fellow in CIFAR's Child & Brain Development program and professor of psychology and social behavior at the University of California, Irvine, who has been tracking the mental health of adolescents and their use of smartphones for a decade, finds that smartphone usage is positive for many teens, supporting the development and strengthening of friendships. But for some teens, this isn't the case. In fact, it can lead to negative effects offline. "In the past 25 years, income inequality and the opportunity gap between children from low-income families and their more affluent peers has been growing. They have increasingly less access to resources, and lower levels of adult investment," says Odgers. "It would be disastrous for many children to see this gap replicated in the online world." While Odgers understands the concerns some parents (and presumably aunts and other close relatives) may have, she cautions that “giving into fear could prevent researchers and policymakers from identifying the real determinants of mental health.” Instead, Odgers proposes that researchers “use the data to understand the very different experiences that young people from diverse backgrounds are having online," she writes.